The trio of captains for the 2019-2020 season officially received the “C” at Saturday morning’s team banquet. 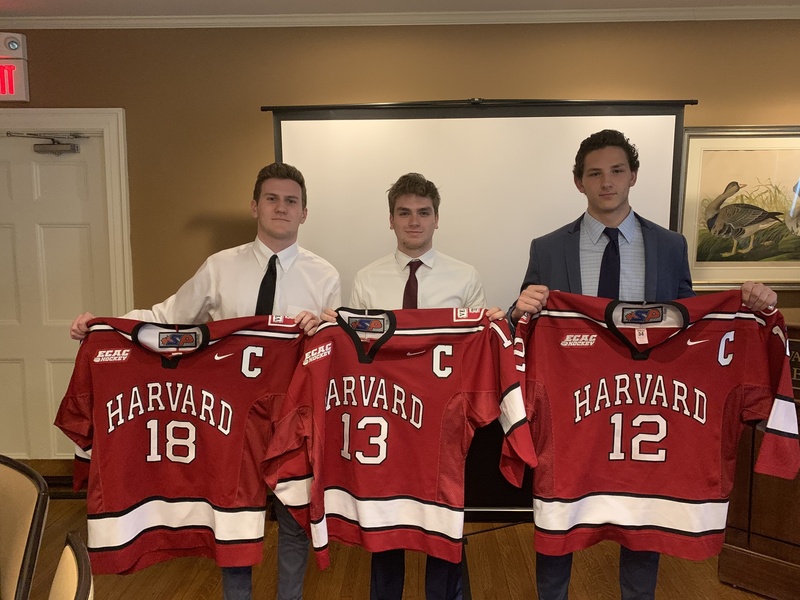 On Saturday, the Harvard men’s hockey team announced its three captains for the 2019-2020 campaign. Forward Nathan Krusko and defensemen Adam Fox and John Marino will each don the “C” as seniors on next year’s squad. The 2018-2019 iteration of the Crimson convened for one final time on Monday, where team members voted in the trio of letter-wearers — only the second instance of three captains in program history following a leadership group comprised of Eddie Ellis ’18, Jake Horton ’18, and Merrick Madsen ’18 two seasons ago. Fox, Krusko, and Marino will take the reins from outgoing fourth-years Michael Floodstrand and Lewis Zerter-Gossage, who led this year’s team back to the NCAA Tournament despite a talented team in 2017-2018 falling short of this milestone. This triad of captains hopes to build on the promising, youth-led season that just recently concluded. Fox, Harvard’s offensive juggernaut on the blue line, enjoyed his most productive year to date this season, setting a program record for most points by a rearguard in a single campaign (9–39—48). In mid-February, the Jericho, N.Y. native eclipsed the 100-point plateau, becoming the first junior to do so since Wisconsin’s Justin Schultz in 2011-2012. He finished the season with a whopping 116 career points (22–94—116). From his first shift in a Crimson sweater, Fox has served as a key facilitator both at even strength and on the powerplay, where he is especially lethal having led the NCAA in points per game on the man advantage (0.70) this season. For his junior-year performance, the two-time First Team CCM/AHCA All-America selection has been named a top-three finalist for the Hobey Baker Award, given to college hockey’s most outstanding player. With the tri-captain designation, Fox will continue to set the standard with his on-ice play. It is no secret that Fox’s skillset is NHL-caliber. Numerous reports have predictably speculated on Fox’s future, many claiming that the defenseman is not interested in departing the collegiate ranks for the Carolina Hurricanes organization, which currently owns his rights through Aug. 15 of next year. Nevertheless, Fox has yet to announce his plans publicly, so the default assumption for now is that he will return for his senior campaign. Marino joins Fox as a letter-wearer on the experienced Harvard blue line. A product of North Easton, Mass. and the South Shore Kings youth program, Marino has been a mainstay on the Crimson back end since his freshman season. Marino, who has skated in 101 career games, has logged 42 points (7–35—42) and a plus-38 rating — evidence of his reliable two-way game and oft-overlooked offensive talents. As with Fox, Marino, a 2015 sixth-round pick of the Edmonton Oilers organization, is facing a decision on his professional future. After being drafted, Marino skated in the USHL for a season, eroding one year off the Oilers’ four-year stake to the junior’s negotiating rights. So Marino has the potential to become a free agent after this summer’s Aug. 15 deadline. For the time being, however, the shutdown blue-liner has tabled an official verdict on his post-Harvard career and looks forward to the opportunity to lead the Harvard squad. Krusko will serve as the trio’s only forward captain. The Alpharetta, Ga. native’s career has been marked by multiple highlights, including a recent Lake Placid-clinching overtime goal against Dartmouth in this year’s ECAC quarterfinals and a three-point (2–1—3) outing in the 2017 Beanpot finale worthy of tournament MVP honors. Krusko, a somewhat undersized and shifty winger at 5’9”, has skated on all four lines throughout his three seasons in the crimson and white, totaling 47 points (15–32—47). Krusko’s junior campaign challenged him, as he was tasked with coming back from bilateral hip surgery in the offseason. Between the subsequent lack of summer training and a talented crop of freshmen upping the competition for ice time, 2018-2019 was Krusko’s least productive season. Nevertheless, the forward has emerged from these tribulations as a stronger leader and more dedicated teammate. As Fox, Krusko, and Marino inherit the captaincy, the 2018-2019 season officially is in the rearview. Twenty members of this year’s promising team are set to return next year to accompany their newly elected leaders. In addition to the captain announcement, the team awarded several other accolades at Saturday’s team banquet — a reminder of the squad’s fruitful season. For his stellar on-ice performance, Fox received the John Tudor Memorial Cup, given to the team’s MVP. Fox’s classmate, forward Frédéric Grégoire, took home the Donald Angier Hockey Trophy, as he was deemed to be the group’s most improved player. Freshman Jack Drury was recognized as the most spirited rookie with the George Percy Award, and the team celebrated outgoing co-captain Floodstrand by presenting him with the Ralph “Cooney” Weiland Award on account of his devotion to the game and spirited play. 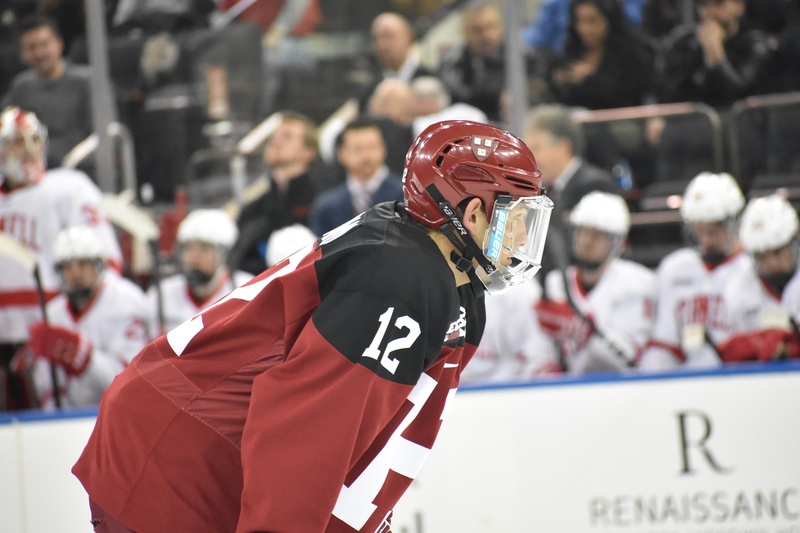 While each new season presents its share of question marks, the 2019-2020 Crimson could very well enter as ECAC favorites, boasting another dynamic group of freshmen to complement the now-wiser young core from this past campaign. 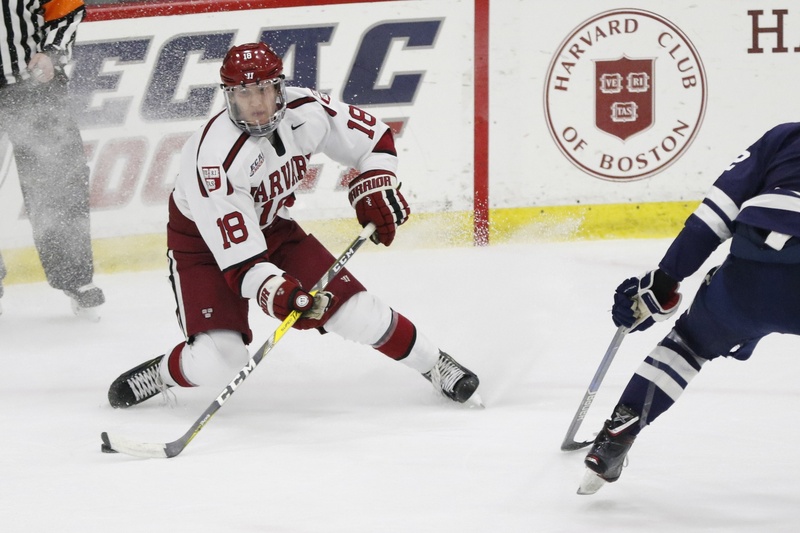 Particularly if Fox returns for his senior slate, it is scarcely an exaggeration to say that Harvard, propelled by a Hobey Baker favorite, an experienced blue line, and a skilled forward group, will contend for a national title. Leading the charge will be Fox, Krusko, and Marino, who hope to captain their team back to the Frozen Four after experiencing it as wide-eyed freshmen three seasons ago.